"Globemallow" redirects here. It may also refer to members of the genus Iliamna. Sphaeralcea is a genus of flowering plants in the mallow family (Malvaceae). 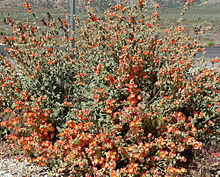 There are about 40-60 species, including annuals, perennials, and shrubs. Most originate in the drier regions of North America, with some known from South America. They are commonly known as globemallows, globe mallows, or falsemallows. The name of the genus is derived from the Greek words σφαῖρα (sphaira), meaning "sphere," and αλκεα (alkea), meaning "mallow." The leaves of these plants are spirally arranged, and usually palmate or toothed. Both stems and leaves are downy. Like other Malvaceae, the flowers are saucer- or cup-shaped, with the stamens joined into a column in the center. Sphaeralcea species are used as food plants by the larvae of some Lepidoptera species including Schinia olivacea, which has been recorded on S. lindheimeri. Wikimedia Commons has media related to Sphaeralcea. ^ "Genus: Sphaeralcea A. St.-Hil". Germplasm Resources Information Network. United States Department of Agriculture. 2007-03-12. Retrieved 2010-04-08. ^ Quattrocchi, Umberto (2000). CRC World Dictionary of Plant Names. IV R-Z. Taylor & Francis US. p. 2529. ISBN 978-0-8493-2678-3. ^ "Sphaeralcea". Integrated Taxonomic Information System. Retrieved 2011-08-01. ^ a b "GRIN Species Records of Sphaeralcea". Germplasm Resources Information Network. United States Department of Agriculture. Archived from the original on 2000-11-19. Retrieved 2011-08-01. This page was last edited on 21 October 2018, at 04:37 (UTC).